My friend asked me to make this Cars Cake for her son’s third birthday party. He LOVES anything "Cars" related. Lightning McQueen wasn't the theme of the party, but might as well have been as everything revolved around the party was about the movie Cars! I used the Wilton Cake pan and baked an out of the box cake. That was very simple, I just followed the general instructions bake at 350 for 30-40 minutes. After the cake was cooled I cut the bottom to level the cake with a large bread knife, then I flipped it onto my cake board. I covered part of a cardboard box with tinfoil. Next step was the icing. The little details are a pain, but overall was worth it. 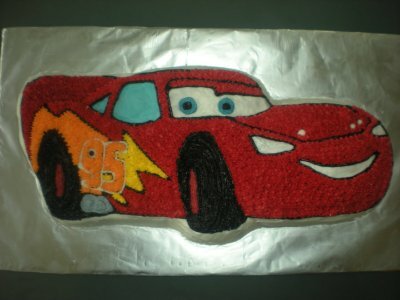 I tinted the icing and used the Wilton tips 3, 16 and 21 to ice Lightning McQueen cake. Red is the hardest color to tint! Here is a hint that works well - tint the icing first a pink (easy) and then tint it with the no taste red. This cake turned out to be a real focal point at the party. The cake tasted great and my friend’s son loved that he had a Lightning McQueen cake for his third birthday party!